The Batch Code field indicates which thank you letter this payment will receive. It is not automatically populated with the names of your thank you letters. If you add a new thank you letter and need a corresponding Batch Code for it, you will need to add that as well. 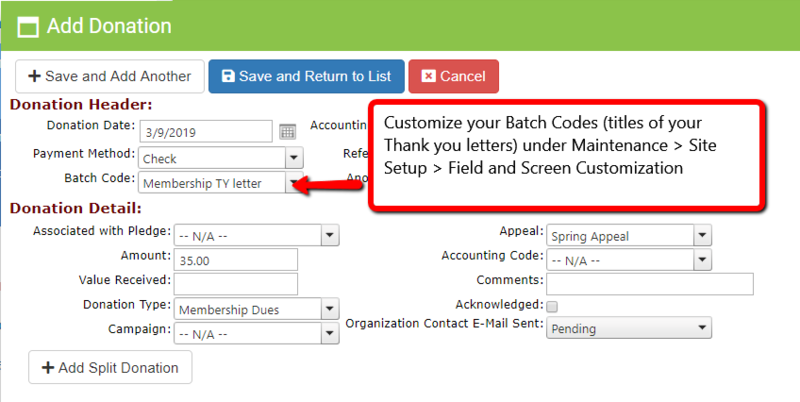 Customize the Batch Code drop-down under Maintenance > Site Setup > Field and Screen Customization > DonorSnap Site Lookups. Here you can add, remove, and rename existing items in the field. 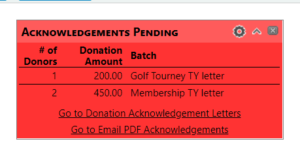 Add the App to your Dashboard for “Acknowledgements Pending” to show all pending Thank you Letters, separated by their Batch Code.